Dear Mona, I Still Buy CDs. Am I Normal? I still buy CDs. Am I normal? Don’t want to make you feel strange, but there’s hardly anyone like you left. Do you know how I found the right words to tell you? I was inspired by lyrics from the Outkast album “Speakerboxxx/The Love Below,” which I bought in 2003. I haven’t bought a CD since, and I’m not on my own here. According to Nielsen’s SoundScan (the source used for the Billboard charts), that album sold about 3.1 million copies in 2003, more than twice as many as Bruno Mars’s “Unorthodox Jukebox” managed in 2013, even though they were both the fifth-best-selling album in the year they were released. I’m tempted to put it down to the fact that Mars’s talent simply doesn’t come close to Outkast’s, but the fact is, the music industry has changed a lot in those intervening 10 years, partly because there are fewer customers like you. 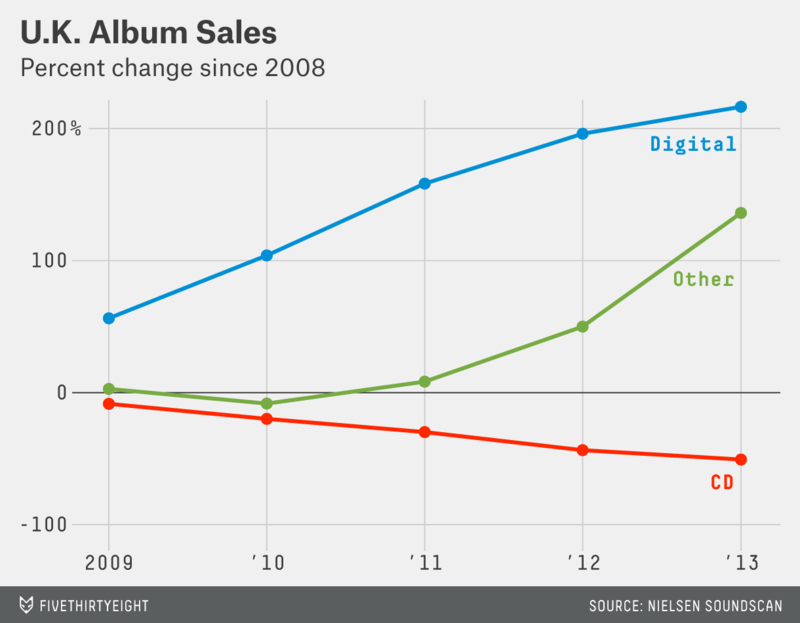 Digital album sales have soared since 2007, but they haven’t been enough to offset the overall decline in album sales (this includes just albums; it doesn’t count single-track digital purchases). 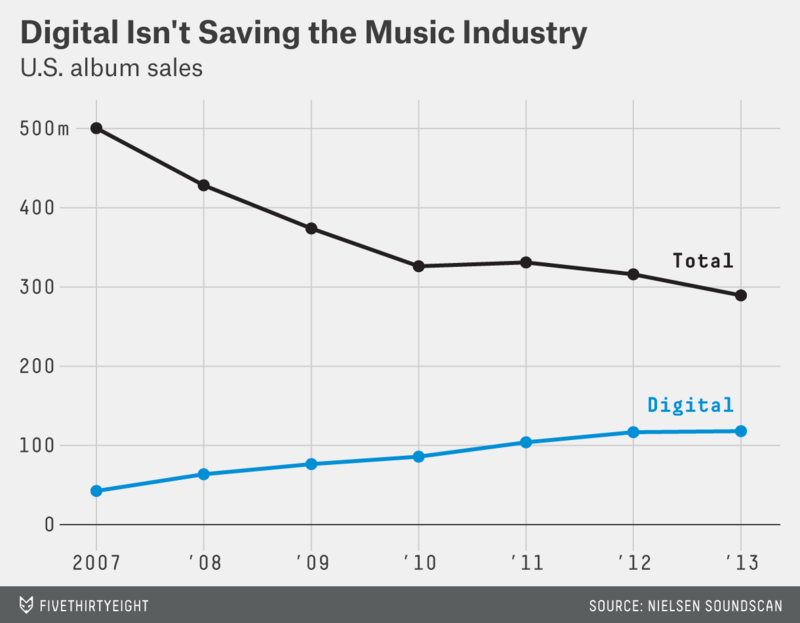 How much of that decline is due to fewer CDs being sold? It’s hard to say, because we don’t have detailed historical data for U.S. sales. But in the U.K., where Nielsen does have a more detailed breakdown, it’s clear the death of the CD explains a lot of the reason behind the music industry’s declining sales. But what’s this “other”? And why is it on the rise? Well, it turns out, you’re not the only discophile. Cassettes and minidiscs are all but gone, but LPs are on the rise in the U.K. — up from 210,000 albums sold in 2008 to 780,000 in 2013. And it’s not just Brits. 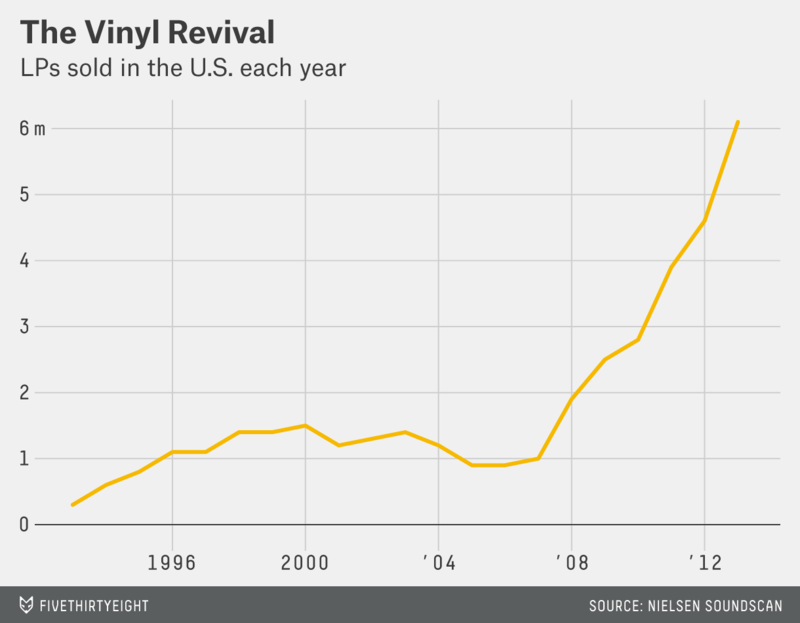 Americans are getting into vinyl, too. If you had told me you were into LPs, I would have said you were somewhat abnormal but getting a little more normal every year. Case in point: Jack White’s new album, “Lazaretto,” sold 40,000 vinyl copies this week, making it the biggest week for a vinyl album in the U.S. since 1991. But you’re into CDs, so now we gonna break this thang down for just a few seconds (sorry Outkast, sorry everyone). Nielsen published data showing that 165.4 million CD albums were sold last year (down from 193.4 million in 2012). Once we subtract those CDs, as well as LPs and digital sales, from all albums sold, we’re left with almost nothing: That confirms how obsolete cassettes and minidiscs are. But more importantly, those CD sales confirm there aren’t many Americans like you: Just 0.5 CDs per person were sold in 2013. Let’s face it, though, there’s an elephant in the room, and it’s got an eyepatch and a peg leg. Many people are arguing that the death of album sales isn’t all down to fewer CD-buying Mikes in Honolulu — it’s about piracy. In reality, the evidence points both ways about whether music piracy affects legal sales. But morality and legality aside, you’re probably a lot less normal as a CD buyer than you would be as someone who illegally downloads music (looking at music per person per year): According to MusicMetric, in the first six months of 2012, Americans downloaded 96.7 million music files from the BitTorrent file-sharing network. As we’ve explained before, illegal activity isn’t exactly ripe for statistical analysis, so it’s hard to know whether that figure really does represent 11 percent of Internet users age 13 and older. Unless you want to risk “five years in prison and/or $250,000 in fines,” it’s probably not a good idea to switch to illegal downloads, no matter how many Americans are doing it. I’d suggest that if you want to become more normal when it comes to your music habits, it might be time to ditch CDs (surely the constantly cracking cases are reason alone?) and switch to legal digital files. Or, if you want to join a small but growing number of Americans, go for vinyl. The only drawback: You won’t be able to use a Discman. And now I’m feeling nostalgic.